Hakone Torii | Flickr - Photo Sharing! vipinfo2000, J. Carlos Roldán, and 17 other people added this photo to their favorites. Beautiful colors. Creates a wonderful feeling. This is awesome - love the two-tones - and really love those greens! 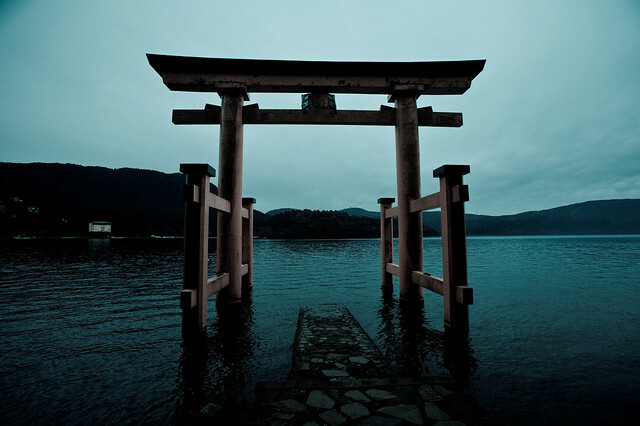 The torii is not level, look at the waterline. lovely colors and composition - great use of the lens! Makes me wanna go! Great geometry and a wonderful "keeper" of a shot!! i think i like this blue tori gate picture better than the other tori gate pic, even thoguh the other one got more comments. I'm installing a torii gate on your head.